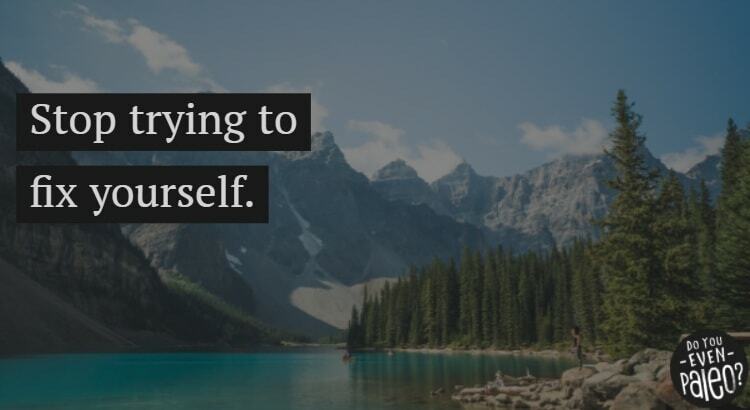 Stop Trying to Fix Yourself. Make Change FOR Yourself Instead. Spend enough time on this planet, and you’ll notice that everywhere you turn, society is telling you to fix yourself. Especially around New Year’s, when so many people set resolutions or goals, messages like “this is the year to finally lose weight and love yourself” are ubiquitous. The implication in that message is that losing weight is the path to loving yourself. You’re only going to love yourself if you lose 5, 10, 50, 150 pounds. That’s ridiculous. Not to mention completely untrue. See the difference? Self love shouldn’t hinge on your weight, your appearance, or fixing something that’s “wrong” with you. Change doesn’t have to mean fixing a flaw. Let me back up and give you a little insight into why this little shift in thinking means so much to me. I have a checkered past with myself. I was bullied for my weight most of my childhood. I didn’t know why I was an overweight kid, so I grew up thinking something was inherently wrong with me… Something that could be fixed if I just lost weight. My self esteem was at rock bottom. Self confidence didn’t exist for me. So when I reached high school, I stopped eating. I binged. I chanted to myself that if I ignored the hunger and skipped eating one more day, I might like the person I saw in the mirror tomorrow. I had suicidal thoughts. I spent a lot of my teenage years crying, hating myself, and wishing I could just be someone else. 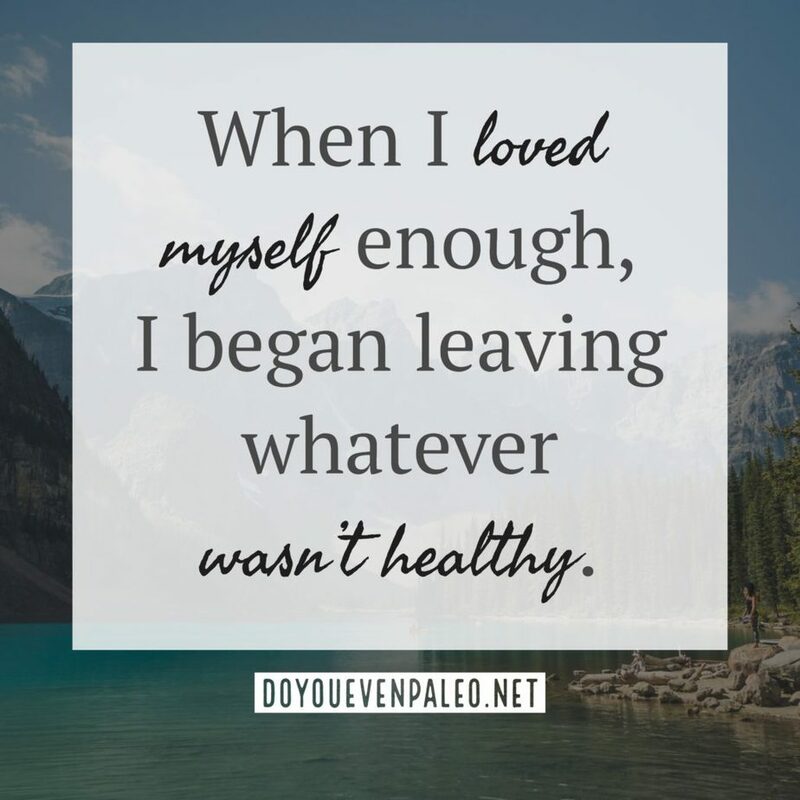 Eventually, I started eating again, but only to pursue a neverending quest to fix myself so I could finally love myself. Years later, I had my aha moment while scrolling through Pinterest one night. For whatever reason, a quote screamed out to me, and I was so moved by it that I wrote it down on a Post-it note and stuck it to my computer monitor so I would see it every day. I sincerely wish I could attribute it to someone, but I don’t remember who said it or where it was from. I just had that sticky note to look at every day. That quote flipped the script for me. Instead of thinking “I’ll lose weight, then I’ll be healthy and love myself,” it put all the emphasis on loving myself first. Gradually, I realized that even if I hit some magical goal weight, I still wouldn’t like me, the person inside. Instead, if I did things for myself instead of fixing myself, I’d create lasting change. Your self esteem doesn’t miraculously change with a number on the scale. That quote was truly the template for me to heal my relationship with myself. I identified the qualities that I liked, and what I needed to work on. I joined CrossFit and went paleo not to lose weight, but to treat my body better and improve my headspace. I left old, toxic friendships and surrounded myself with people who lift others up. I actively tried to limit negative self talk. Gradually, I changed. I was smiling more, laughing more. The bad days were fewer and far between. I found that my self confidence was improving. I stood a little straighter, and held my chin higher. 5 or so years later, here I am. I’ve been in the same 15 pound range from the beginning. If I lose 5 pounds? That’s cool with me. If I gain 5 pounds? Also cool with me. My belly and arms flop around when I lift weights. My cheeks are a little rounder than they could be. But what really matters to me is that I look in the mirror to see the healthy, confident, positive woman I know I am, not the sad girl with desperate, dying eyes that I used to be. I sincerely wish I had learned sooner the huge impact that difference in mindset makes. How powerful the shift is between making change from a place of love rather than from the deep pool of hate. Part of what made this quote so powerful for me is the first clause. “When I loved myself enough…” Right there. Did you notice it? That little indication that you don’t have to love yourself completely to make change for yourself. Because frankly, I didn’t love myself. But that portion of the quote spoke to me, encouraging me to think hard about any pieces of me that I did like and didn’t like. I had just a couple things I liked, but that was enough. So I started leaving the parts of my life that were unhealthy—mentally and physically—and started adding what I thought could make lasting, impactful change in my life. I’m sharing all of this because you might be in the same boat I was. Turning every which way to try and fix yourself, hoping that the latest “fix” will result in self love. 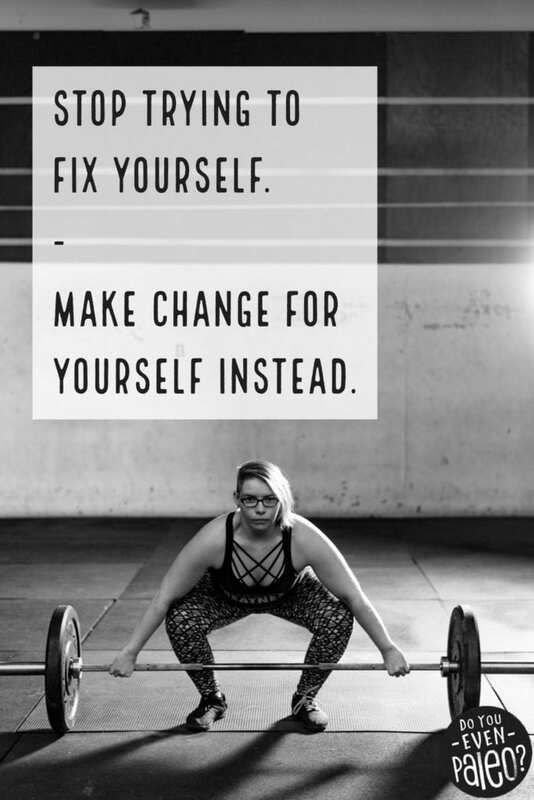 Make change for yourself, not to fix yourself. True, lasting change starts with a positive intention, not a negative one. You can do this. You’ve got this. And your life will be filled with so much more joy when you make change because you love yourself enough. Chelsea, your beautiful post made me cry…I am very thankful for Women like You, who actually tell the truth and tell the others not to follow the game of “starting Monday i will…” or “2018 brand new me”. We have to love ourselves for who we are and not live by wishing for something we are not. You are beautiful and you are strong. God bless! Don't subscribe All Replies to my comments Notify me of followup comments via e-mail. You can also <a href='https://www.doyouevenpaleo.net/comment-subscriptions/?srp=3592&srk=87505361eee98908ddf6ccb8681f50d6&sra=s&srsrc=f'>subscribe</a> without commenting.